This letter was sent via email on 8 March 2013, 3 pm. We are a concerned group of NUS students, alumni and staff who have been, or are currently, student writers at the Kent Ridge Common, an independent online student newspaper. 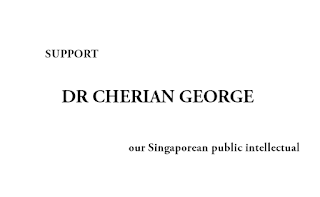 Like other concerned Singaporeans and Singaporean public intellectuals, we found the recent decision by NTU to deny tenure to Dr Cherian George bewildering. After reading extensively on available news coverage regarding this issue, we have decided to send you this letter, which we will be publishing on KRC as well, to urge you to open your doors to Dr Cherian George and hire him. Dr Cherian George is a well-respected academic as well as a sociopolitical commentator. His book, The Air-Conditioned Nation, was the first book to be included in the KRC Reading List, which includes reading material that KRC editors recommend to new writers for their edification. His other works have also been highly-acclaimed and praised by many of his peers. Further, he has won teaching awards before, and as the recent, passionate responses from NTU students and alumni attest to, he was a great teacher. Thus we strongly believe that his addition to the NUS community will greatly enrich campus life and benefit NUS students. 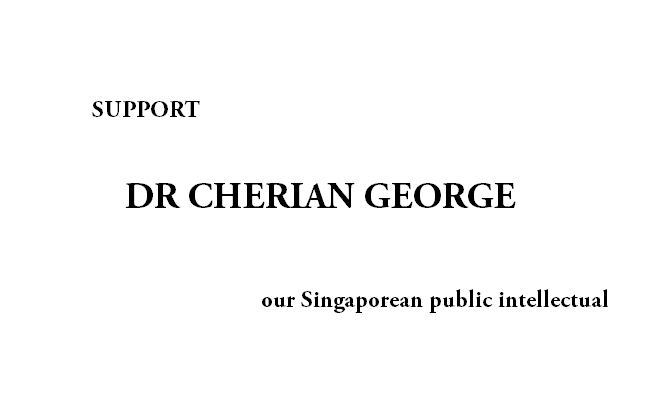 The admirable actions by NTU students to start a petition for Dr Cherian George, as well as the Open Letter written by a group of Singaporean public intellectuals (the list of which includes NUS professors, who have set a great example for us), have spurred us on in our decision to write to you to proactively seek out Dr George and have him on our campus. NTU’s loss can be NUS’ gain. We urge NUS’ leadership to offer Dr Cherian George a post in NUS’ Communications and New Media Department, where we believe he will be able to contribute much in terms of research, teaching and service to the community. In University Town, advertisement banners exhort students to “be the change”. If the NUS leadership is sincere about this message, and about the kind of education they claim to offer – one that promotes critical thinking, that imbues students with the courage to change mindsets, systems and take risks – then they should recognize the value that Dr Cherian George has brought to our society and can bring to our campus, and match their actions with their words. In the wake of GE 2011, the events of the past year, and the recent release of the White Paper, there is an increasing disappointment and alienation by the way the older generation is running our institutions and our country. In the face of such bewildering developments, we can only hope that our public intellectuals would be treated with due respect. Singapore should be welcoming to her public intellectuals and to Dr George. We believe that Singaporeans should not be compelled to withdraw from the place that they call ‘home’. Let NUS be the change in this situation, and be a positive force for our society. Thank you very much and we look forward to your favourable response. If you, like us, hope to encourage NUS to proactively seek out Dr George and invite him to join our NUS family, do add your signature to this open letter by leaving your full name and position (within the NUS community) in the comments thread below. We will be checking the thread and will add your name and details to the body of this article. If you're an NUS student, alumni or staff reading my blog now, please consider visiting this link to express your support for our cause.